We have a long-running questionnaire that goes out to our OTP mailing list, where we’re actively soliciting our readers’ input on article topics. Often the topic has already been covered in a book, lecture or DVD, and when that happens we can excerpt the material from the product and quickly answer the request. Let’s do that today. The request was for more information about loaded carries. Aha! Got that covered in Gray Cook and Dan John’s Essentials of Coaching and Training Functional Continuums lecture video. We break into this “loaded carries” segment of Essentials of Coaching and Training Functional Continuums after Gray and Dan have coached four volunteers through a warmup that includes holding the kettlebell in each of the carry positions. Gray Cook: In addition to weight, work capacity is also about time. I’ve got some criteria for these loaded carries: You need to control the position. You’re going to walk with the kettlebell we selected, starting with the right hand, kettlebell overhead. You’re going to walk continuously for a while, but you get to change positions at will. Every position change is easier than the one before. At no time should you need to stop. At no time, even if we take this drill into the 12 or 15-minute mark, will you be above a conversational endurance load. As a coach, I’ve found that when you’re doing a workload where you can still talk, you can still hear. But if you’re doing a workload that’s got you breathing hard, you can’t hear anything I’m saying. I could be talking, but it’s not making it in. We’ve got two kettlebell instructors, one at each end of the room. If you’re bringing poor integrity to the overhead carry, they’re going to say “take it down,” which is to the racked position. If your racked position shows poor integrity, they’re going to say “take it down,” which is to the suitcase carry. When you can go no longer do that, take it to left overhead, then the left rack position and then left suitcase carry. I would rather you change position early than be told to change position. This way you acknowledge your lack of integrity before it’s visually apparent. When you’ve spent about 80% effort, bring the ’bell down a position. If these coaches have told you to take it down three different times, it means you’re not aware of your alignment with integrity under load. And if you’re not good with the ’bell overhead, you’ve got to cover the distance in only four positions—right rack, right carry, left rack and left carry. Overhead, the elbow should be straight. The wrist should be straight. If you don’t feel that, bring it down. This drill only works if you control quality. Dan John: You’ll get a sense of upper body mobility issues just by the overhead and rack positions. A playing card should be right there between the body and the arm. It should be tight, biceps to the ear, but if you can’t do that, why not? Gray: During the warmup, I kept saying, “push it down, pull it down.” No matter what position, pull the kettlebell to the ground. When you’re carrying it down by your side, push it to the ground, but not so much that you lose your alignment. Here’s what happens: The weight starts getting heavy when you try to lift it. When I carry overhead, I’m not trying to lift it to the ceiling. I’m trying to carry it with integrity overhead. When it’s racked, do I want to carry it like a tray of drinks or do I pull it to my center? Pull it close. Keep it in and pull it down. Pack your shoulder. This is one of the central problems in Western fitness: We try to lift things before we have carry capacity. Take the kind of weights you want to lift and carry them. Let’s carry those with alignment and integrity under load. Guess what would happen if we all did more carries than lifts? You wouldn’t be looking for correctives. This can help your endurance. It can help your core stabilization. It can help your posture. This is where balance starts—carries, not with deadlifting; not with bench pressing and not with single-leg deadlifts, and not with Turkish getups and swings and push presses. Balance starts with work capacity. Alignment with integrity is good balance. A balance beam on the floor is a pre-requisite for this, but now alignment with integrity under load is a good rebuttal. Dan: In our observations, a lot of guys who have big engines struggle with the rack position in loaded carries because they’re trying to hold it like Mr. Universe. They break quickly rather than letting alignment work. The other thing you’ll notice is that a lot of people—especially people who’ve been in collision sports—struggle with the overhead carry. They might be okay to military press or even one-arm press, but the moment they begin to walk, that little spiraling happens. This gives us an insight into the problems. The waiter walk is something you really need to add into your programs. Gray: A new group having never done this before can usually go 10 to 15 minutes with the carries. The only criteria for choosing your kettlebell: I need you to be able to bottom-up carry on each side. If you can’t bottom-up that weight on both sides, you need to go down a weight. Your bottom-up kettlebell strength on the left and right actually tells us how you use the rest of your body. Go to the lowest kettlebell you’re bilaterally connected with and develop your workload there. If you don’t do the bottom-up test upfront, you will not have success in this drill. It’s scalable only if you look at the integrity of the neurological system. That’s how I pick the weight. It’s not a weight I test with. It’s a weight I train with. Don’t do this without the coaching your clients. People will not change positions when they lose integrity; they will change when they get tired. But this is a quality-based drill. Take it down before you lose integrity. Dan: We call these loaded carries “The Cook Drill.” Here’s Monday: Get Back Ups, do some goblet squats and these carries. Pick a kettlebell that you can do a bottom-up with on both sides. This is how we choose the best weight for the carries drills. At the point you lose alignment in the suitcase position, switch the kettlebell to the other hand and take it overhead. The criteria we use is 80%—when your alignment drops to 80% of optimal, move to the next lower position. If you’re unable to carry it overhead with integrity, begin the carry in the rack position. Overhead integrity means the elbow is straight, the wrist is straight, shoulder is packed and your arm is near your ear. 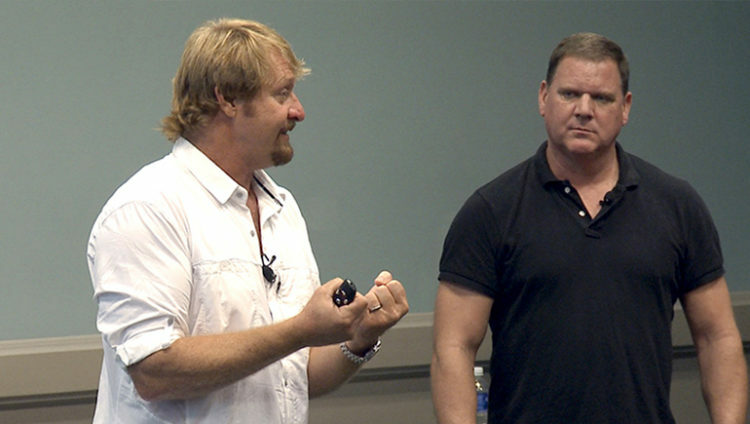 This was a short segment of the transcript of Gray Cook and Dan John’s Essentials of Coaching and Training Functional Continuums lecture video. Click that link to view more clips from the lecture.